This entry was tagged As Seen On TV!, Bad ideas, Boscov's, Causes for therapy, Cthulhu, flashmob, Gym equipment, Opportunistic, Pennsylvania, Susquehanna Valley Mall, The Clash. Bookmark the permalink. That’s not a tray of Honor Snacks, is it? Was there a coin slot into a little cardboard box for your $.50? Maybe the delivery person dropped them off there for a minute while he/she went to pee…? Plus, does anyone besides me know what Honor Snacks are? I thought I knew from wtfery, but…wtf? I know what Honor Snacks are! I don’t think that was the case with this, though it would make me feel better if that were true. 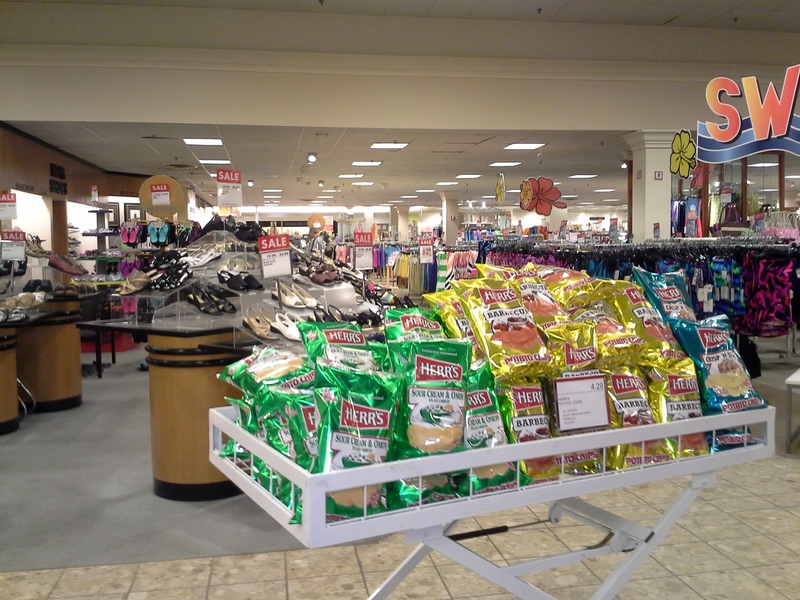 I was there yesterday and perused the shoes at Boscovs (opting to buy a pair at BonTon instead) but said chips display was no longer there. Perhaps it was placed there to entice movie goers such as yourself? By the by–what movie did you see? We saw Gatsby the other day and pretty much liked it.